For many years, I’ve personally made a commitment to be an advocate for commuter cycling and pedestrian/bicycle safety. And we’ve got a lot of exciting things happened in the greater Miami community: The Underline, The Ludlam Trail and coming to South Miami in November is WHEELS, an engaging way to encourage more use of alternative transportation. Get an intro on WHEELS on page 14 in our “In & Around” feature, and go online for a great overview of the program and invitation to be very much a part of it. 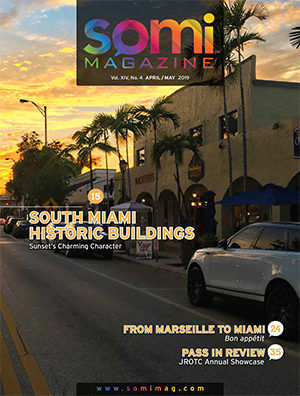 In this issue we continue SOMI Magazine’s commitment to provide updates to our readership regarding The Underline, the ambitious project to transform the fallow land under the Metrorail from Dadeland to downtown Miami into an urban park and trail. 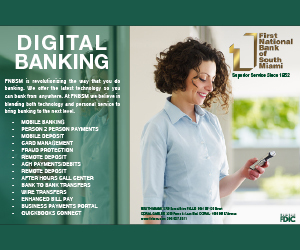 We’re providing a periodic update in each issue (see page 33). SOMI Magazine supports this project and the development of the Ludlam Trail, key trails which will ultimately increase the cycling connectivity throughout the county. 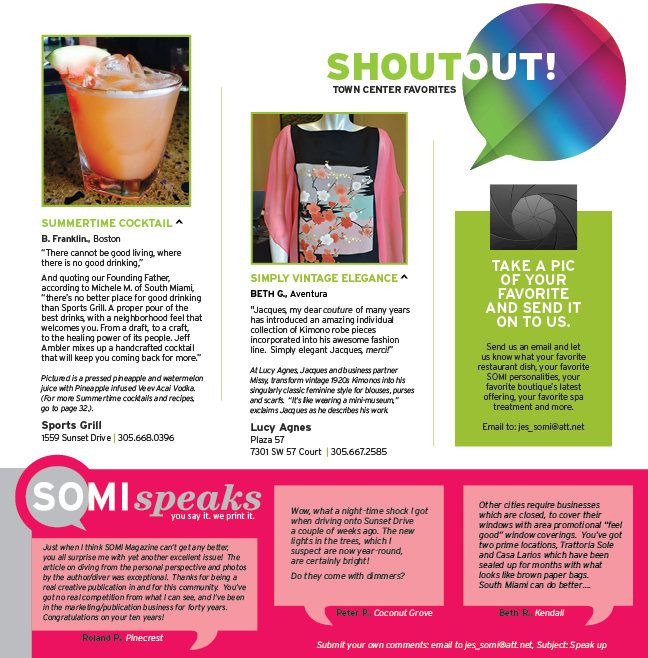 In recent issues, SOMI Magazine has been bringing our readership information about our community cultural resources. We’ve brought you cover features on Fairchild Tropical Botanic Garden, The Underline proposal and the John Pennecamp State Park and Biscayne National Park. In this issue, I invite you to ride your bike to a Metrorail station, secure it, and take the Metrorail to the Government Center Station, walk downstairs and visit HistoryMiami, which will be in front of your eyes. 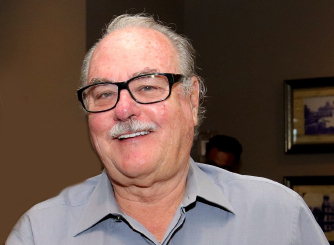 HistoryMiami (formerly the Historical Museum of South Florida) is celebrating its 75th anniversary and presents compelling permanent and temporary exhibitions. 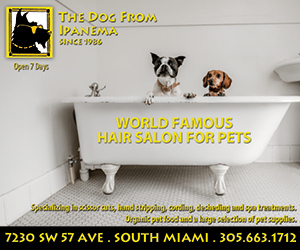 And coming soon will be SOMI Magazine’s visit to see all the $35 million improvements to ZOOMiami, celebrate the 15th Anniversary of the Adrienne Arsht Center, and tour the historic Barnacle in Coconut Grove and much more… Join us as we explore our back yard. Summer Fun is all around us… With a centerfold photo spread, we’re zeroing in on some of the fun and excitement of the summer, and events which reflect our family-oriented community. The Team FootWorks 5K RUN/WALK on the last Sunday of May kicked off the SOMI summer as hundreds upon hundreds descend on our streets to enjoy sport, music, food, friends and family. This year, it was a very special 5K in honor of the late John “Papa Hans” Huseby. Celebrating America’s independence is also another great time for families to come together to enjoy games, picnics, music and a great fireworks show. To the annual list of fun summer things to do around the area, we’ve added two: the love of mangos and the love of diving for spiny lobster. And send us your pix…. It’s becoming more usual to report on multiple restaurant openings in our What’s New feature, and that’s a good sign. As we go to press, renovations are being done on three vacated restaurants: Trattoria Sole, Casa Larios and Barceloneta. And read about a new boulangerie and patisserie now open on Red Road & US1. I’m certain in our next issue, I can introduce you to SOMI’s newest restaurants. Several new boutiques have recently opened in town; you can also read more about them in the News segment of the magazine. And as reported in our last issue, The Shops At Sunset Place has been sold. Plans are being discussed for vast improvements to The Shops. Stay tuned to SOMI Magazine for an announcement coming later this fall as the plans are revealed. This is the last installment of SOMI Magazine’s Tenth Anniversary. We start our eleventh year this fall with our October/November issue. I invite you to “Be Part of the Conversationsm” and weigh-in with your comments in our Readers Survey which is online. Your comments are always welcome and much appreciated. Many readers often comment about how exceptional our covers are – thank you! Please let us know which your favorite from this year (see inside back cover). Log onto the online magazine at somimag.com and weigh in with your choice. Your Favorite Cover entry and your Online Survey submissions will earn you a ticket for a drawing. Enter both and increase your opportunity to be chosen for special gift certificates. And while you’re there, how about giving us thumbs up ILIKESOMIMAG on Facebook.